The Southern White-cheeked Gibbon, like all gibbons, has long and flexible arms which can be more than twice the length of their body. They are the longest arms of any primate relative to body size. Males are mostly black with a beard-like white patch around their mouth. Males and females look different (sexual dimorphism). Southern White-cheeked Gibbons are born with a buff coat colour, which changes to black as they mature. Males keep this black coat, while females change again, gaining pale yellow/orange to brown fur with a black streak on the crown or neck as they enter adulthood. 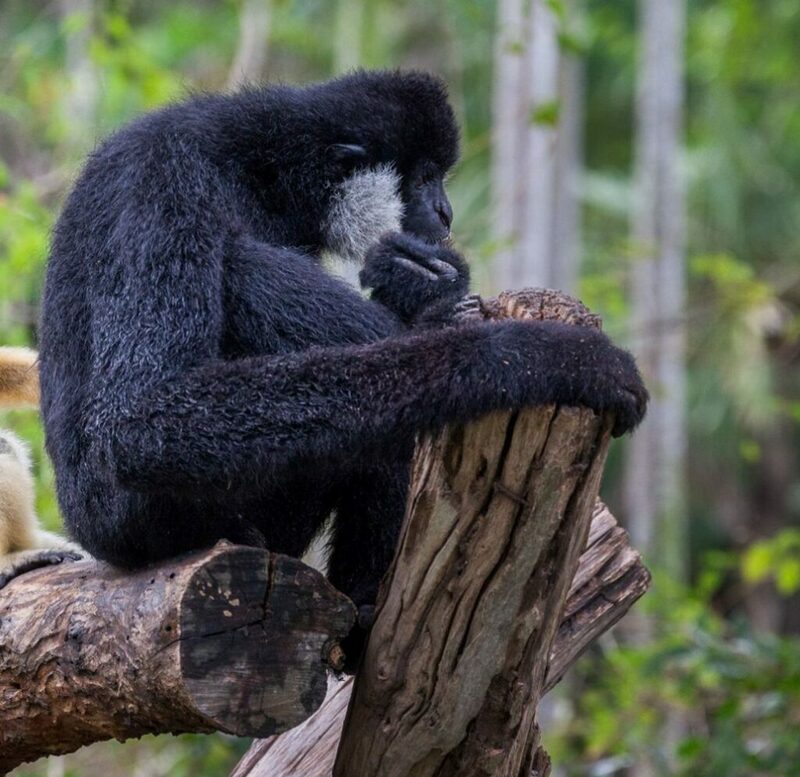 Southern White-cheeked Gibbons are more often heard than seen by scientists on the ground, because they spend most of their time on top of tree canopies. Calls may travel large distances and contain varied information: males often sing early in the morning to declare their territory and females begin a courtship song that is then joined by the males to create a 20-30 minute long duet. They live in small groups made up of an adult pair with two or three young adults. Southern White-cheeked Gibbons are mainly frugivorous (feed on fruit), but may also eat leaves and invertebrates to add to their diet. With their long limbs they can source fruit on thin branches that are out of reach for other primates. Gibbons move between trees by swinging from hand to hand, using their long, powerful arms. This method, known as brachiation, lets them move between trees easily, even where there are wide gaps between branches. Pairs of Southern White-cheeked Gibbons are monogamous. They stay together for life and raise their young together. Young gibbons leave their parents’ territory once they are mature (between the age of three and six years old). Southern White-cheeked Gibbons are mainly found in lowland broadleaf evergreen and karst forests. They live in a fairly small area in southern Laos and north central Vietnam. The Southern White-cheeked Gibbon is listed as Endangered on the IUCN Red List of Species because its numbers have fallen by 50% over a 45 year period (three generations) prior to 2008. The species is threatened throughout its range by hunting for meat and traditional medicines or trapping for the illegal pet trade. The gibbons also suffer from the loss of habitat caused by logging and the spread of agriculture, particularly in Vietnam. The loss of forest habitat is particularly harmful for gibbons because they depend on specific territories. 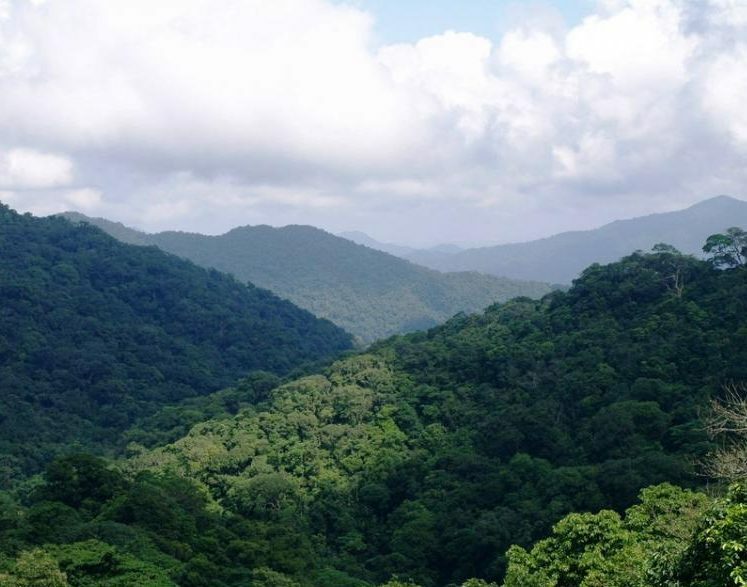 The World Land Trust project in Vietnam, Khe Nuoc Trong Forest, protects an important area for the Southern White-cheeked Gibbon as much of their habitat is so severely fragmented in Vietnam.